But for members of the burgeoning AI art community, there’s another attribute that sets thePortrait of Edmond Belamyapart: it’s a knock-off. The members of Obvious don’t deny that they borrowed substantially from Barrat’s code, but until recently, they didn’t publicize that fact either. This has created unease for some members of the AI art community, which is open and collaborative and taking its first steps into mainstream attention. Seeing an AI portrait on sale at Christie’s is a milestone that elevates the entire community, but has this event been hijacked by outsiders? Goodfellow’s work on GAN is the stuff of AI legend. The story goes that over a few beers with friends one night in 2014, he posed the simple question: what if neural networks could compete with one another? 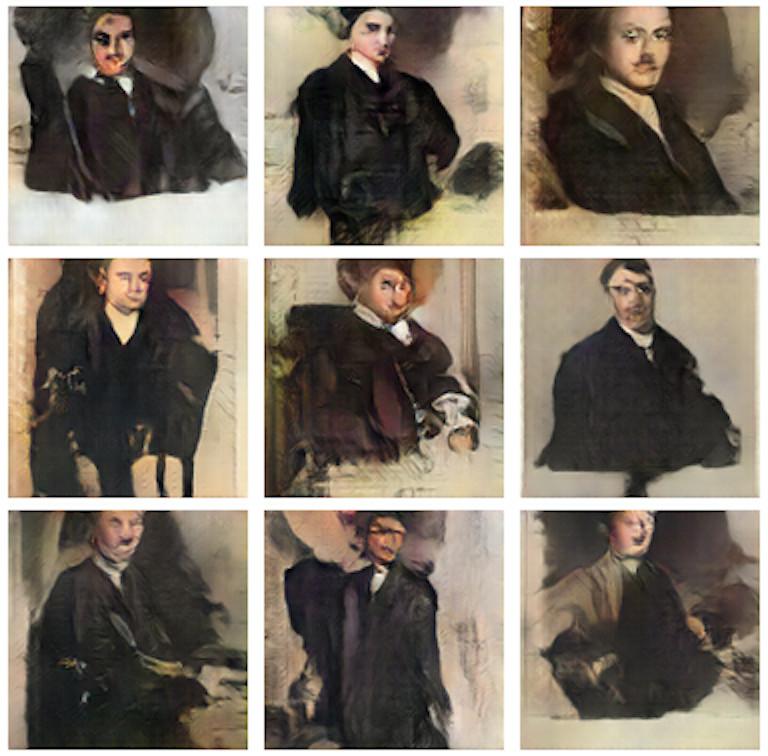 The basic idea of a GAN is that you train a network to look for patterns in a specific dataset (like pictures of kitchen or 18th century portraits) and get it to generate copies. Then, a second network called a discriminator judges its work, and if it can spot the difference between the originals and the new sample, it sends it back. The first network then tweaks its data and tries to sneak it past the discriminator again. It repeats this until the generator network is creating passable fakes. Think of it like a bouncer at a club: sending your drunk friend away until they act sober enough to get in. proposed by Google AI engineer François Chollet: GANism. Exploring the latent space of AI-generated landscape paintings today instead of doing work. Barrat has been a leading light in the world of GAN art, generating headlines with his surreal nudes and landscapes. He also shares the algorithms he uses to create these images on GitHub, helping fellow artist-coders to get the neural networks up and running. This is how Hugo Caselles-Dupré, the tech lead for Obvious and a machine learning PhD student in Paris, found Barrat’s algorithms and used them to generate theBelamyportraits. Exactly how much of the work can be credited to Barrat or Obvious is a difficult question. Generating images using GANs is a multistep process. First, you collect training data with a “scraper” that your network will replicate. Then, you construct the generative algorithm, which is the most time-consuming and difficult part. Next, you start running the algorithm and sort through its output, picking the best examples from the hundreds or thousands generated. Two of Barrat’s GAN-generated nudes. Barrat tellsThe Vergethat Obvious approached him and asked to use a “component” of his code. After that, he says, they “almost immediately started producing work identical to the outputs of the pre-trained portrait and landscape networks” he hosted on GitHub. Other members of the AI art community say whatever changes Obvious made must be minor. Mario Klingemann, a German artist who has won awards for his own work with GANs, tellsThe Vergeover email, “You could argue that probably 90 percent of the actual ‘work’ was done by [Barrat].” Tom White, an academic and AI artist from New Zealand, says the work is extremely similar, even downloading Barrat’s code and running it with zero adjustments to compare the outputs. Images generated by White using Barrat’s code bear a striking resemblance to the Belamy portraits. In this sense, the auction is already a grand success, turning heads and generating press coverage around the world. In turn, it’s conferred on Obvious the sort of credibility that comes with an endorsement from an institution that previously sold the world’s most expensive painting (Leonardo da Vinci’sSalvator Mundifor $450 million). What might be the most interesting thing about theBelamyauction is that, with not much more than some borrowed code, an inkjet printer, and some enthusiastic press releases, a trio of students with minimal backgrounds in machine learning ended up at the center of a milestone in art history. Caselles-Dupré certainly still seems to be in shock from the turn of events. “We are just really, really, really surprised,” he says, adding that it’s a “relief” to be able to tell the full story. “For us, the best-case scenario was that we’d get one or two articles, sell some pieces, get some money, and do another project.” Instead, they’re flying to New York to put AI art on the map. Hopefully, they won’t be the last.